Since 1947, Vulcan Industries has provided complex, precision metal stampings and assemblies for some of America’s most successful and diverse original equipment manufacturers (OEMs). Our design and engineering team works with you throughout the design, quoting, production, assembly, inspection, packaging and shipping process to ensure that we meet your requirements. To learn about how we solve tough manufacturing challenges, view our case studies. Part shape: The complexity of the part along with the material thickness, part tolerances and the number of operations required, often dictate the best manufacturing approach. Stamping materials: We process a wide range of materials including cold and hot rolled steel, stainless steel, aluminum, copper, brass and other specialty alloys. Material thickness can range from 0.003” up to .312”. Tooling: We have the capability to design and build progressive dies for high-volume production of complex parts. In addition, we also offer single and multi-stage tools using manual and automated part transfer systems. Our technical support capabilities are a cornerstone of our success. We employ the most highly skilled engineers in the business with experience in all aspects of precision metal stampings, tool design and secondary processes. Each project is carefully analyzed to identify the critical factors for successful production to ensure we fully understand what needs to be done and how it should be done. Design software: We use AutoCAD Mechanical and Solid Works. Our tool designers are experienced in the design of single, multistage and progressive tools. Design review: Design reviews are performed on all precision metal stampings to ensure accuracy to confirm that the part can be successfully manufactured. Often times we collaborate with our Customers to suggest improvements to help simplify the design. This process typically results in lower customer costs, easier manufacturing and seamless assembly. Tooling: We design and manufacture 95% of tooling in-house. Particular attention is given to features such as part accuracy, repeatability, reliability and tool life. Our team of skilled tool and die makers build service and maintain all tooling. Problem solving: A project manager is appointed for each order. It’s their responsibility to monitor production and resolve problems, whether in-house or with component suppliers. This ensures parts are correct and delivered on time. Continuous improvement: We continually seek ways to improve processes, reduce waste and, through lean manufacturing techniques, reduce overall costs. Value-added operations allow us to supply parts directly to your assembly line to satisfy your production schedule. We oversee the entire manufacturing process from managing inventories to sourcing any components we do not manufacture in-house. Experienced quality team dedicated to providing full project support including FEMA and PPAP submissions. Full service quality lab with some of the latest equipment. Commitment to capability studies for customer defined Cpk’s. 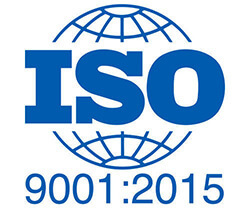 ISO 9001:2015: Our quality management systems conform to ISO 9001:2015 requirements. We have been accredited since 2009. Read More About the ISO 9001:2015 Certification. Quality PPM: We achieve exceptionally low defect rates. On-time delivery: We consistently deliver on time, achieving better than 99.9% delivery scores. Attention to detail: We focus on every detail to ensure the components we make are right in every aspect. Add value: We focus on adding value and strive to reduce your overall costs. Since 1947, we’ve built our reputation on manufacturing expertise, quality and customer service. Consistent Quality: With trained support personnel on hand 24/7, our highly skilled tool and die makers ensure tooling is kept in excellent condition to provide consistent quality. Easily Adaptable to Customer Needs: Our production capabilities are geared toward manufacturing high quality stamped steel components and quickly responding to customers’ changing needs. We Exceed Expectations: Our people, process and capabilities are designed to ensure customer expectations are not only met but exceeded. This is demonstrated by our consistent ability to achieve low PPM failure rates while ensuring on-time delivery. Superior Customer Satisfaction: We achieve superior customer satisfaction through personal involvement and an inherent belief, that the customers’ needs come first. On-time delivery: As an integral part of our normal production process we develop contingency plans to ensure you will not be affected by supply interruptions. As a result, we consistently achieve 99.9% on-time delivery.